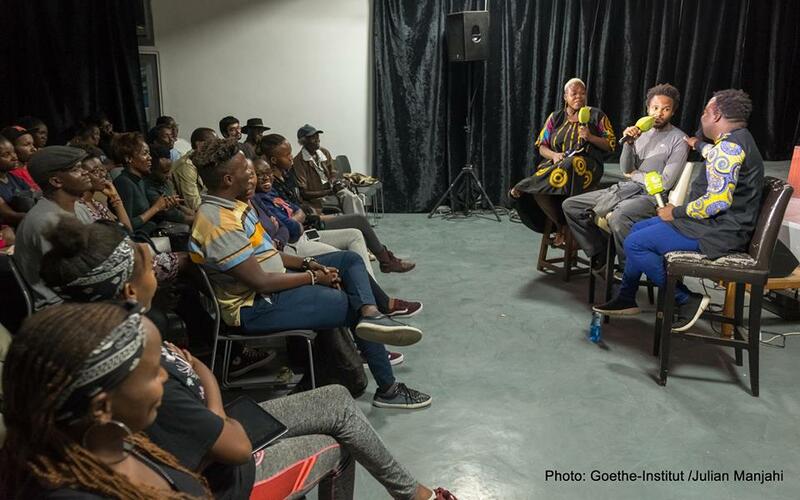 It was a rocking evening at the Goethe Institut in Nairobi as Kenyan actor Abu Sense gave a performance portraying Malawian writer Shadreck Chikoti’s Azotus The Kingdom on Wednesday, March 27, 2019. The event included a question and answer session featuring the author Chikoti and the actor Abu Sense moderated by session creator Zukiswa Wanner. In Artistic Encounters, two artists of different genres meet and create an art experience of their combined work then share it with the audience. The popular series founded in 2017 by Zukiswa Wanner has been running since the first one featuring Victor Ehikhamenor alongside Koleka Putuma. Since then Nairobians have gotten to see artists from Kenya, Nigeria, South Africa, Sierra Leone, Zimbabwe, Germany, and The Gambia. The Artistic Encounters series this year kicked off with the portrayal of the novel Azotus The Kingdom by Malawian writer and publisher Shadreck Chikoti by Kenyan actor Abu Sense. Abu Sense who has made his name with theatre productions like Too Early For Birds started his presentation by screening a pre-recorded movie trailer. Check out some of it here. Abu made Azotus the Kingdom relatable to the local audience with allusions to the Turkana drought but still kept it rooted in the book as he highlighted man’s eternal quest for freedom. The performance was lapped up by the audience which had filled the Goethe Kenya auditorium. When the performance ended the audience got a chance to interact with the author who had flown in from Lilongwe specifically for this event and the Kenyan actor. Afterward audience members got to buy the book and have them autographed by its author. Here are more images from the warm Wednesday evening in Nairobi. All images on this post are courtesy of Julian Manjahi/ Goethe Institut. Fred Mbogo has his copy of the book signed by Shadreck Chikoti. Check out the previous editions of the series below. Actors Sitawa Namwalie and Shan Bartley alongside author Yewande Omotoso. Previous Previous post: Novuyo Rosa Tshuma makes Dylan Thomas Prize 2019 shortlist. Next Next post: Ellah Wakatama Allfrey is new Caine Prize for African Writing Chairperson.